Custom audiences are one of the best-kept secrets of Facebook’s paid advertising platform. They allow you to reach people who you already have a relationship with – and isn’t it easier to get to home base when you’ve already made it to first (that’s a baseball reference for those of you who aren’t familiar with America’s favourite pastime)? 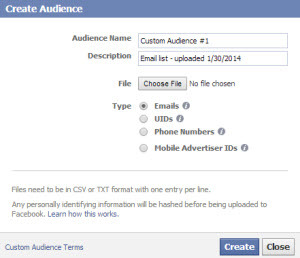 Using Custom Audiences, you can create groups of Facebook users based on their email addresses, phone numbers, Facebook user IDs or app user IDs (note: “Website Custom Audiences,” based on people who have visited your website recently, are available to some users on a trial basis but have not yet rolled out globally). For example, if you do any sort of email marketing, you already have a list of people who’ve opted-in to receive your content. If these people haven’t already “Liked” your Facebook page, they’re an obvious place to start expanding your community. It might seem obvious, but many marketers make life harder for themselves by approaching each platform from square one, rather than building on their previous efforts. Setting up a Custom Audience is as simple as logging in to the Facebook Power Editor, clicking on the “Audiences” menu and selecting “Custom Audience” from the “Create Audience” drop-down menu. You’ll be required to approve the Custom Audience terms, but then you’ll be able to create your audience by filling out the fields below and uploading a CSV or TXT file with your customer data. If you’re trying to increase your “Likes” you’re going to have much better luck targeting your Page Like ads to people who have joined your email list but haven’t followed your page than by sending your ads out to random people who have had no previous exposure to your brand. 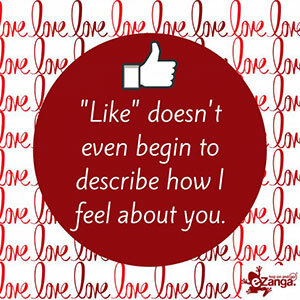 This will ensure that only people who haven’t already “Liked” your page will see your ad. Next, scroll back up and select the “Advanced” link under the “Audience” tab. Enter the name of your audience in the “Custom Audiences” field and you’re ready to play ball. Depending on the type of ad you’re running, you may find it helpful to add other Audience filters to your ad. For example, if you plan to run a number of ads on your Facebook page for future sales promotions, you may decide to advertise only to people who are 18+ and can legally make purchases on their own. 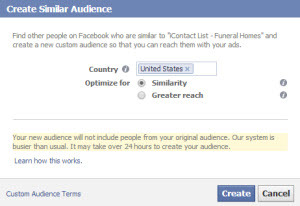 Now that you know how to create Custom Audiences within Facebook’s PPC program, the possibilities are endless. Okay, maybe not endless. But you’ve just become a much smarter social marketer. One way to take this type of targeting to the next level is to create smaller Custom Audiences based on the stage each customer is at in your sales funnel. Each of these list segments could become its own Custom Audience, receiving its own custom Facebook ads. Take that last segment as an example. Could you turn that sub-group into a Custom Audience and then target them directly with Facebook ads offering unique coupon codes for first-time purchasers? Why, yes you can! And I bet you’ll be amazed at the results. On a related note, you can also use Facebook Custom Audiences to reach out to people who are no longer active in your sales process – for example, subscribers who used to open your email messages but haven’t done so in months. Use the same procedures described above to create Custom Audiences based on your lagging customers, but be careful how you target them. If you’re a retailer, a paid ad reading “We’ve missed you!” might seem cute. But if you’re a healthcare marketer, it may read as creepy. Consider your audience carefully and then use Custom Audiences to send an appropriate message to the folks you’re in danger of losing. Of course, maybe they’re just not that into you. What happens when you’ve exhausted your marketing channels? At some point you’re likely to hit a wall when reaching out to existing leads – and that’s where Lookalike Audiences come in. By identifying the common characteristics of the users in your Custom Audiences (the interests listed on their Facebook profiles, the pages they’ve “Liked,” etc.) Facebook can scan its entire membership and identify similar users who are likely to be receptive to your messages. Using these lists, you can reach out to potential new customers using a combination of Page Like ads and Promoted Posts. To create a Lookalike Audience, head back to the “Audiences” menu and click on the name of the Custom Audience you want to emulate. In the screen that appears below, click “Create Similar Audience,” specify the country in which you’d like users to reside and choose to optimize either by similarity or reach. Click the “Create” button and your new Lookalike Audience will be ready to market to within a day or two. When used together, these targeting techniques allow you to reach out to people who have already taken a shine to you, and those most likely to think you’re their type. Eric Siu is the CEO at digital marketing agency Single Grain and interviews entrepreneurs (including Unbounce CEO Rick Perreault!) weekly at Growth Everywhere.